After reading Bobbi Brown's Beauty Evolution book (Available in Amazon, BookDepository), I realized how I'm not living up to my age. The way she described it, the woman who doesn't have time for herself is the woman in her thirties (because of work, family, kids). Heck, I don't even have kids! I shouldn't be excused for not having "me-time". In that spirit I whipped out a few of my recent pampering favorites. It was then that I noticed how my product preference has a very "natural" inclination! I just love products that are made with natural ingredients. I find that they are the kindest to the body. I find it oddly peculiar how it's a habit of mine to care for my hair while I remove unwanted hair! Even under me-time minute I try to do so much in one go! I figured, since I'd be taking a while shaving my legs (yes, I'm a monkey); the best way to make the most of the time is to also have my now longer than ever hair deep intensive moisture. That way, I step out of the shower with smoother legs and silkier hair. Speaking of Me-Time, I've been enjoying my tea-escapes at my favorite Coffee Bean and Tea Leaf branch the past few weeks. For that, let me dedicated this week's Bright Beauty post to CBTL. I'm a veryvery happy customer. :p Oh, and yes. I'm buying the tea cans not solely for the tea... but also for the canisters itself! So cute! Oh by the way, when you're at CBTL, don't forget to try the Chilled Spicy Chicken Pasta Salad (did I get the name right?). Anyway, it's SO YUMMY! By the way, the lovely baristas from EDSA Shang branch told me they're opening a number of branches and one of those just opened at Davao! Okay, this is not a sponsored post OK? I just love CBTL so much and I want you to know that they're expanding! yey! Do like their Facebook page. How about you? How do you enjoy your me-time? BrightBeauty is a Sunday special beauty-zine project for LovingSunshine.com It's a weekly special feature on all things beauty with a bright attitude because it's always best to start the week bright! BrightBeauty is a blogging project meant to challenge my wits and ignite my growing passion towards making beauty more accessible and fun! If you have a BrightBeauty feature request, don't forget to comment or tweet me with hashtag #brightbeauty. Thank you for supporting this project! Don't forget, October is my birthmonth so I will be giving away two prized Guerlain lipsticks to one lucky reader! :) I invite you all to join! This giveaway is open internationally. I like chocolate mint oolong tea with milk and sugar myself. :) Thanks for hosting a Guerlain giveaway! Guerlain has the classiest makeup packaging. Agree, Guerlain has amazingly classy packaging, always! I looove drinking tea over coffee! Now that it's fall here in the US, the weather turns cooler and that's when I love to drink hot tea! 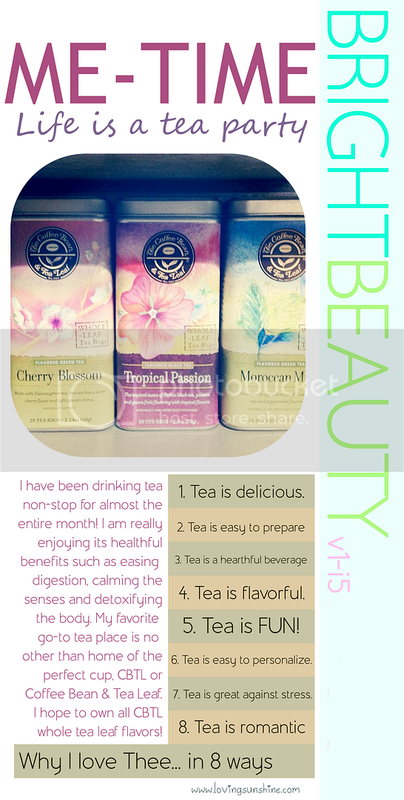 My favorites are black tea (like Earl Grey), mint tea (so refreshing and good for digestion) and fruit flavor teas! Nothing like sipping hot tea while surfing online! Have you tried the teas i sent you? I love my green tea but I have yet to venture out and try different flavours of tea! But come this fall and winter, I am for sure going to venture out a bit more!